Here’s a saying you’ve heard before: There are never enough hours in the day. And if you’re saying this more often than not, then it’s time to re-evaluate your sales process. To generate more business, you need to increase your productivity and eliminate inadequate tools not just for the sales team but also for your marketing, HR, finance and legal teams too. 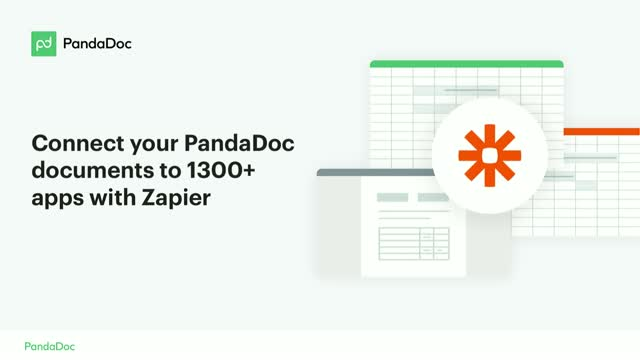 Join us for a webinar where we’ll show you how PandaDoc and Zapier can help you connect over 1,300 apps so that you can reduce your busywork, simplify processes, streamline communication and ultimately make you much more efficient. A new year calls for a fresh start. But how are you applying your resolutions to your sales strategy? In this webinar, Mike Paladino, Head of Sales here at PandaDoc joins Mailshake Co-Founder Sujan Patel to discuss the top sales trends you’ll want to follow this year to close deals faster and win more revenue. Sales enablement will still be a big theme in 2019, how can we be more strategic around creating content for sales? The use of AI in sales is becoming bigger and bigger, are reps being replaced with robots? How can we as sales continue to build a better relationship with marketing in 2019? There are a ton of tools on the market promising to help reps do their jobs faster, which ones are best for automating top and bottom funnel sales activities? Sales operations is a necessity, but what are some specific areas our operations team should focus on this year? The age of digital transformation is happening but how have you applied it to your sales process? How do you ensure that you are staying ahead of the prospecting game? What are you doing differently than your competitors to win more business? Even if your product is superior, you still have to sell a step above everyone else. Join PandaDoc and Autoklose to learn how we empower our own sales teams with technology and the right training to boost productivity and double revenue. Join us for this in-depth product-focused webinar on the basic functionality of PandaDoc. We’ll walk you through how to create, send, track, and eSign proposals, quotes, and contracts so you can close deals faster. We’ll also showcase time-saving features designed to streamline your sales process. Pricing is one of the highest impact growth levers in a business, but most companies spend less than 15 hours per year on their pricing strategy. To make matters worse, sales practices around discounting, poor customer research, and improper targeting result in significant losses that can't be made up by just spending more time on acquisition-based growth. ^ These situations can be extremely frustrating. And — truth be told — no one comes out a winner. There is a better way to align sales and marketing on the plays you need to drive timely and targeted follow-up with your best leads. We're bringing together Drift’s Alex Orfao and Nick Christolos and our own Denis Malkov, Director, Revenue Operations, to talk through the essential plays for building the most effective lead follow-up sequences, and how you can get sales and marketing on the same page once and for all. In this recorded webinar, we'll discuss why you should send proposals over boring quotes and legal contracts and the 8 elements you must have in your proposals. We'll also give a high-level overview of PandaDoc. A sales reps’ daily responsibility is to cut through the noise of the competition to gain their prospect’s attention. But this is nearly impossible these days when the prospect’s inbox is flooded with more messages to respond to than there are hours in the day. Join this discussion where we talk about the cold email and proposal tips you need to make sure your message jumps straight to the top with a killer subject line and the content you need to include in your proposal to increase your sales success. Getting new hires started isn’t something that just happens overnight. Investing in onboarding is an important part of any HR strategy. It takes a lot of work and careful planning to ensure new team members can truly hit the ground running. Join TPD and PandaDoc as we join forces to share knowledge of best practices and successes. Jared Fuller, VP of Sales of PandaDoc and Kyle Bastien, Senior Sales Trainer of ProsperWorks are delivering the 5 prescriptions every sales team needs to alleviate the pain points of their prospects. They'll break down how to perform effective disco calls, effective pain mapping prior to the demo, and how to provide valuable takeaways that will have your prospect turned to a customer in no time. For any B2B company, one of their primary goals is to grow their business and increase productivity. Unfortunately, teams often struggle filling their pipelines with qualified opportunities and then spend much of their time hoping they will close. Tune into our webinar with KiteDesk where we will discuss how to find high quality leads with effective email outreach to create a solid, predictable pipeline. We will also discuss tips and techniques for timely follow-ups to ensure those deals make it to the finish line and meet your revenue goals. Sales are always looking for additional channels in which they can increase the number of opportunities in their pipeline. But often, they don't even consider the help of their customer success teams. Join us for a webinar with Zendesk and our very own Jeremy Malander, Director of Customer Success, to hear the mistakes he learned early in his career so that you can better help your customer success team to fill sales' pipeline and also increase upsells. Studies show that businesses of all sizes struggle with organization and efficiency amongst sales teams. If this is proving problematic for your business, join PandaDoc and Insightly as we proactively discuss practical, real-world solutions for creating control out of chaos. According to HubSpot research, only 3% of people consider salespeople to be trustworthy. So what does that mean for a salesperson like you? You need actionable steps to build trust with your prospects quickly. Learn how to increase your close rate! Up your sales game - adopt the latest activity-based and sales enablement techniques. Tips and trick from experts, which you can quickly put into your organization sales processes. Learn how anyone in sales, from the enterprise sales expert to an individual entry-level sales rep can adopt activity-based selling to increase closing rate. It’s the most powerful, promising and successful way to sell. It puts you in the driver’s seat, gives you visibility into your pipeline, builds your confidence and even makes selling more fun. Activity-based selling and sales enablement go hand in hand. The marketplace has changed. Buyers now have more tools and resources at their disposal to help them through the purchase process. Thus, sales teams often struggle to close deals and spot new opportunities. Sales enablement content has also undergone a transformation - modern tools and visual content are available to sell value and provide meaningful insights. Budgets for sales enablement have doubled to $2.4 million in the past two years, and companies have also increased their investment in sales enablement technology by 69% (SiriusDecisions, 2014). Timo Rein is an expert on activity-based selling and will cover advice for the top of sales funnel. Timo is the co-founder and president of Pipedrive, a provider of sales CRM software that gives sales teams control over their selling processes. He has 15-plus years experience as a salesman, sales manager and software entrepreneur. Mikita Mikado is a master of sales enablement techniques and will talk about the bottom part of the funnel from his 11 years of experience in sales and running various software business. Mikita is co-founder and CEO of PandaDoc, makers of all-in-one software that enables easier, faster delivery of high-quality, personalized documents. Marylou Tyler - Author of "Predictable Prospecting"
Marylou Tyler believes in the power of 3. Whether it’s in your sales methodology, your day-to-day habits, or even this webinar series. Save your seat for Part 3 where she will go through her optimization framework. Registering for the webinar will not only save your spot, but you’ll get access to templates and resources you can start using right away. There isn’t a part 4, so this is your last chance to get the inside secrets from Marylou. See you soon! Now that you have determined what you need to identify the right audience, how do we reach out to them? Marylou is bringing us through part 2 on reaching out at the right time, with the right message, in the right place. Marylou has proven these methods time and time again, and lucky for us, she’s sharing her secrets! Get ahead of the game, and join the webinar to get the inside sales knowledge. PandaDoc is the all-in-one software that streamlines your sales workflows. Create, send, track, and eSign client-facing documents designed to win more business. PandaDoc integrates with your CRM, saves your team time, and provides transparency into your sales performance.